Benzothiazole (BOT), the heterocyclic system consists of five-membered thiazole ring fused with the benzene ring. It is a very potent molecule because of its numerous pharmacological activities like anti-tumor, anti-microbial, anti-inflammatory, anticonvulsant, anti-diabetic, neuroprotective, calcium channel antagonist etc. Due to its extensive biological activities, it is still an interested area of research. Many scientists have discovered various methodologies for the synthesis of 2-aryl benzothiazoles and its derivatives by using different reaction conditions. 2-aryl benzothiazoles were synthesized via condensation of o-aminothiophenol with aldehydes. Previously, it had been synthesized using different types of catalysts to improve the selectivity, purity, and yield of the products. This review article mainly focuses on the synthesis of 2-arylbenzothiazoles using different reaction conditions from 2006 to 2018. 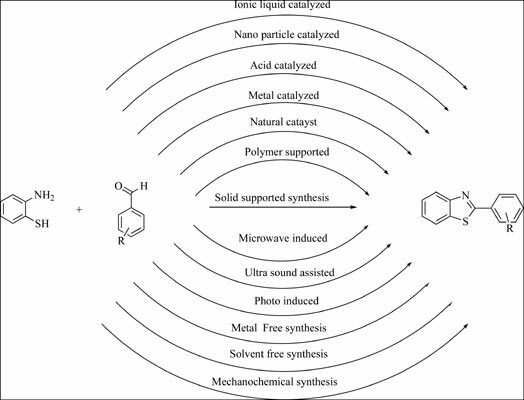 This article is the detailed study of progressive environmental benign pathways for the synthetic strategies of 2-arylbenzothiazoles involving microwave assisted methods, ultra-sonication, use of nanoparticles, photo-assisted methods, metal catalysts, ionic liquids, mechanochemical grinding etc. 2-aryl benzothiazole, 2-aminothiophenol, aromatic aldehyde, green chemistry, nanoparticles, ionic liquids.